In 1884, the Sisters of St. Joseph of Sault Ste. Marie opened the first hospital in Port Arthur to meet the needs of the men working on the railroad. 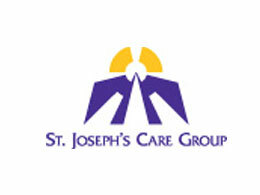 Since then, St. Joseph's Care Group (SJCG) has responded to the unmet needs of the community by changing over time and delivering new and innovative programs. Programs and services are provided throughout the community and at 8 different sites, including: Balmoral Centre, Behavioural Sciences Centre, Hogarth Riverview Manor, Lakehead Psychiatric Hospital, Sister Margaret Smith Centre, St. Joseph's Health Centre, St. Joseph's Heritage and St. Joseph's Hospital. These facilities are operated by the Sisters of St. Joseph of Sault Ste. Marie, sponsored by the Catholic Health Corporation of Ontario and managed by a local volunteer Board of Directors. St. Joseph's Care Group's broad program areas are: Physical Rehabilitation & Complex Care, Mental Health & Addiction Services, and Long-Term Care Services. SJCG has approximately 1700 employees, 400 volunteers and an annual operating budget of $125 million (Canadian).